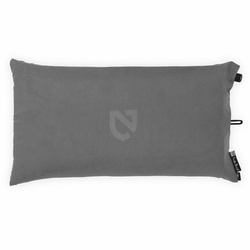 NEMO Fillo Luxury Backpacking & Camping Pillow. Fillo™ is soft and yielding, yet substantial enough for side-sleepers. It’s amazing in the backcountry, but also great on an airplane or as lumbar support. It feels big when it’s cradling your head, but it packs surprisingly small. It’s everything you want in a sidekick pillow for all adventures. Use the shockcord to add clothing and increase the height for comfortable neck support. The shockcord can also be used to hold Fillo™ in place on an airline or car seat for lumbar support. Memory foam adds unmatched comfort but packs small. The ultra-soft microsuede cover is removable and machine-washable.